HEXUS readers were divided on their opinions of Fractal Design's Meshify C when the mid-tower chassis launched back in 2017. One user called it "a case of arbitrary angle syndrome," while another "quite liked the modern art vibe of the front mesh design." 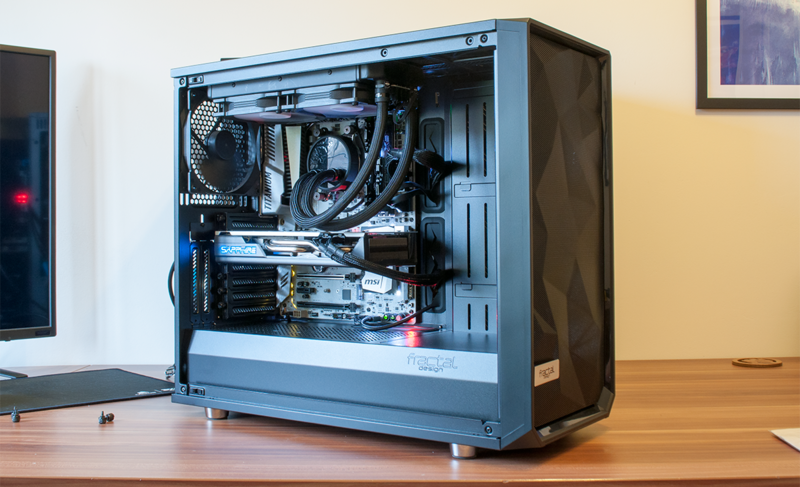 Said case was Fractal's attempt to offer something different from its typically staid enclosures, and though we're historically fond of the firm's Define Series, it was nice to see Meshify mix things up a bit. 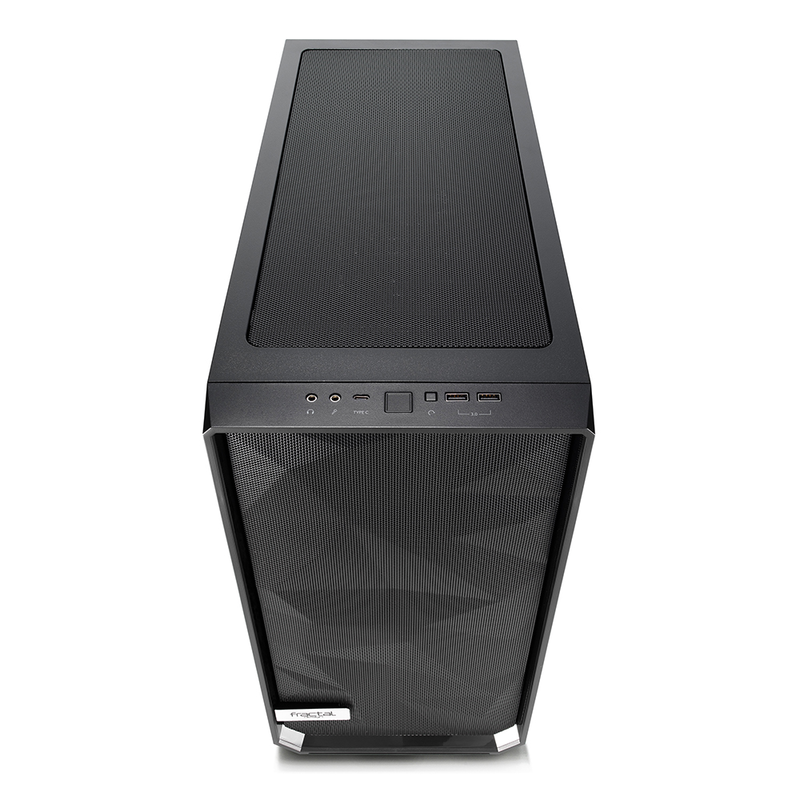 We evidently weren't alone, as sales of Meshify C were strong enough for Fractal to conjure up a larger alternative in the form of the Meshify S2. Fans of Fractal chassis will know exactly what to expect as the product name gives everything away. 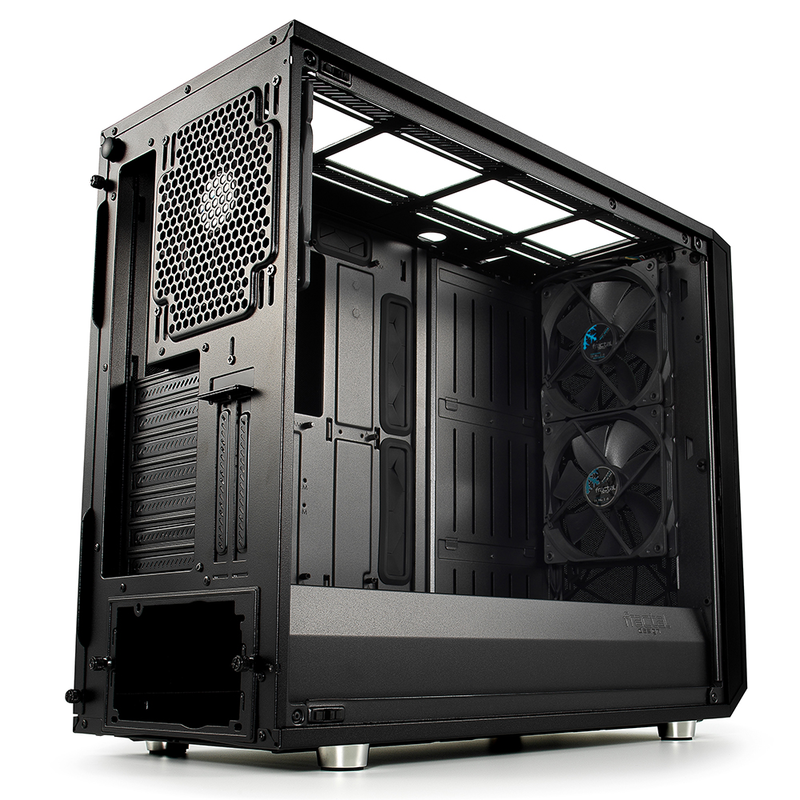 Yep, no prizes for guessing this is effectively the Define S2 body with a Meshify frontage. It is a somewhat obvious blend, yet that's no bad thing; Define S2 is a very decent foundation, and for those who favour the airflow benefits of a mesh frontage, this mash-up promises to be the best of both worlds. 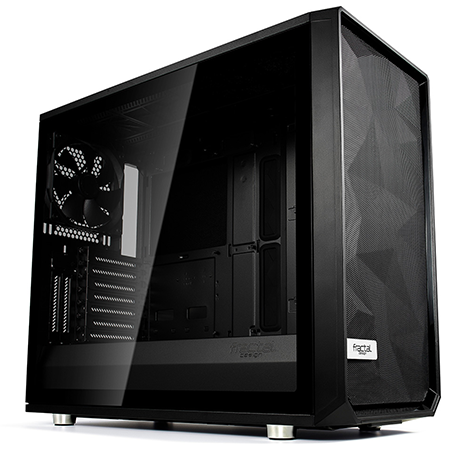 Prices start at £132 for a standard black model with opaque side panels, and rise to £140 for one of three models outfitted with tempered glass on one side. Colour choices include white, black and black with darkened glass (pictured). 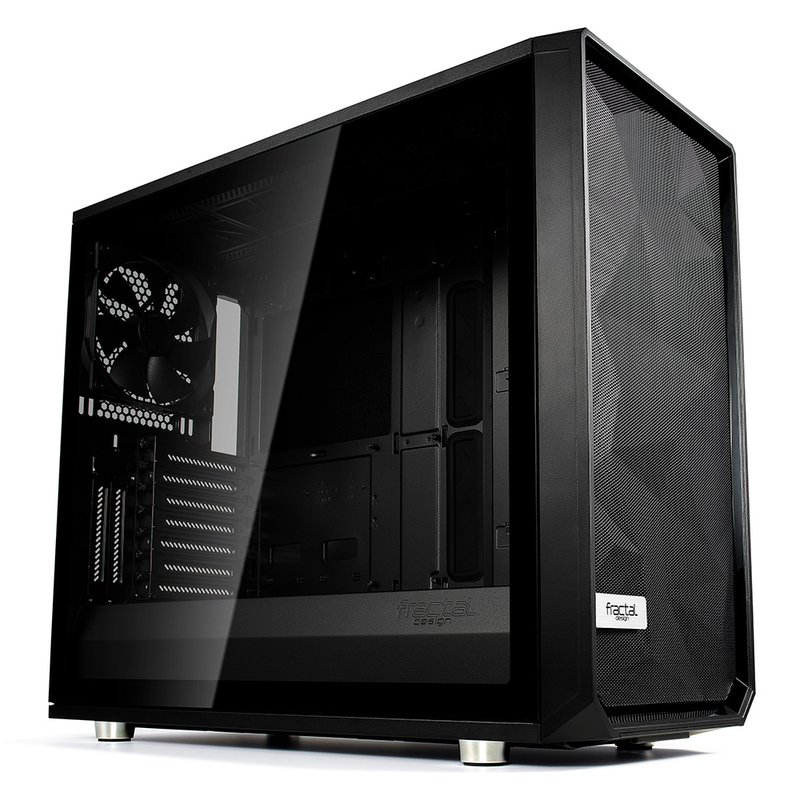 We quite like the latter, as the extra tint gives the case a feeling of luxury and it looks great when there's some RGB lighting on the inside. How about the front panel? It isn't everyone's cup of tea, but we like almost everything about it. The angular pattern catches the light nicely but isn't too ostentatious, the entire mesh section is easily removed for cleaning, and the I/O ports along the top are just about perfect. These include two audio jacks, USB 3.1 Gen 2 Type-C, power and reset, plus a pair of USB 3.0. What's not to like? 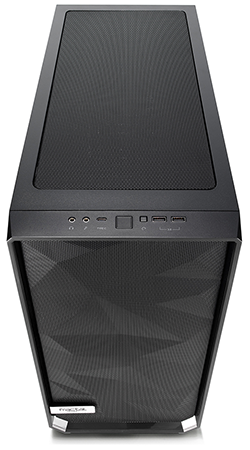 Well, if you happened to be fond of the optional colour mesh panels available for Meshify C, you'll be saddened to hear that they're too small to fit Meshify S2. 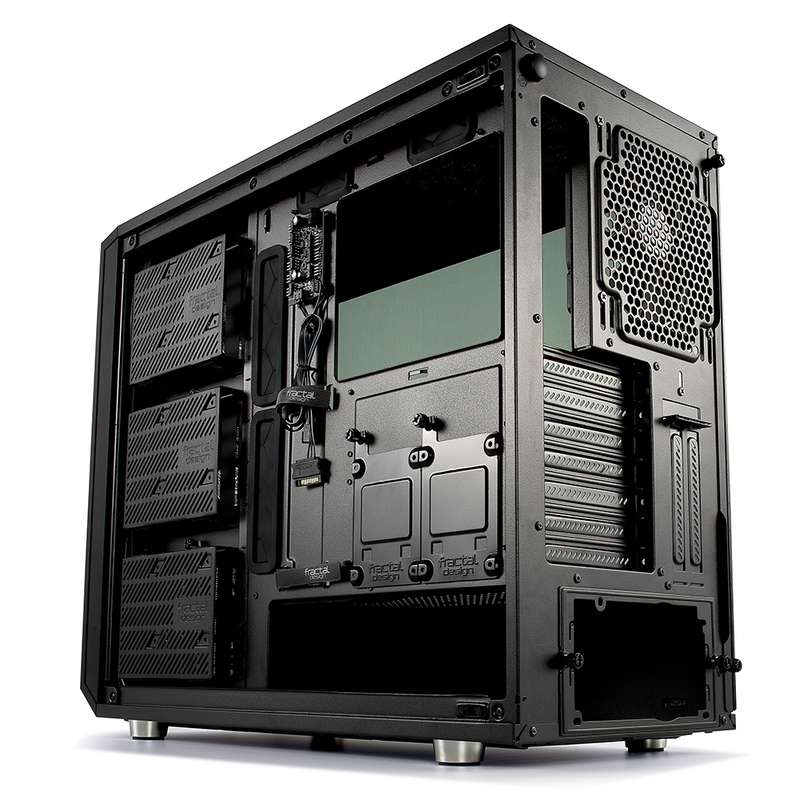 Beyond the front panel, this is the Define S2 as we know and appreciate. Dimensions are practically identical at 538mm (L) x 233mm (W) x 465mm (H), and so too is the internal layout. 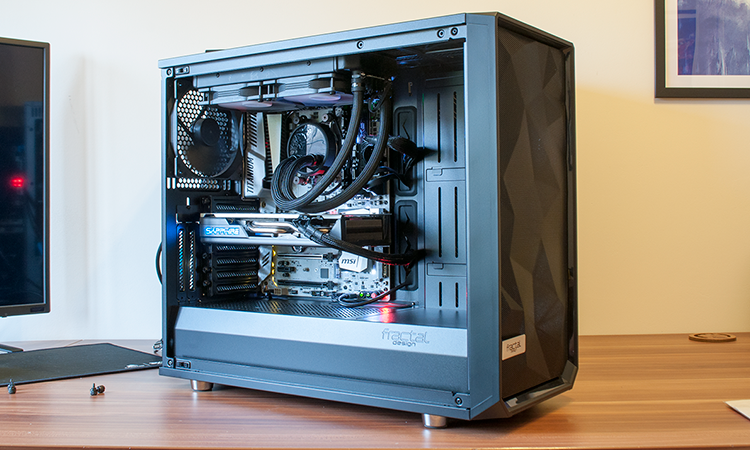 It's worth revisiting our review of the Define S2 to find out what works well and what doesn't, but there is one key area in which Meshify S2 is different. Whereas its sibling is geared for ultra-quiet operation, this 2019 variant is all about airflow and cooling, meaning no sound-dampening material on the top, front or side. Other than that, everything that was good about Define S2 is present and accounted for. That means a 7+2-expansion-slot arrangement supporting vertical graphics card mounting (albeit via an optional riser), a full-length PSU shroud with a removable end cover for front radiator mounting, a mesh top cover that comes away at the push of a button to reveal a removable radiator tray, and three bundled fans. It's handy to get three 140mm Dynamic X2 fans as standard, and there's a Nexus+ PWM fan hub, as well. Attached to the back of the motherboard tray and powered via SATA, the hub supports half-a-dozen three-pin fans as well as a trio of four-pin, and regulates speed from a single PWM header on the motherboard. Out-the-box cooling is decent, but of course Meshify S2 is designed for more. There are nine 120/140 fan mounts in total - three up top, three in the front, two at the bottom, and another at the back - paving the way for up to a 420mm radiator in the roof, up to a 360 in the front, or up to a 280 on the floor. Plenty of room to get creative, and a case as long as this really does need some form of liquid cooling paraphernalia to help fill the void between front panel and motherboard. Our build looks somewhat empty, despite including an ATX board, and for those wanting to go the extra yard, Fractal provides pre-drilled pump mounts and a pair of adjustable reservoir brackets as part of the bundle. 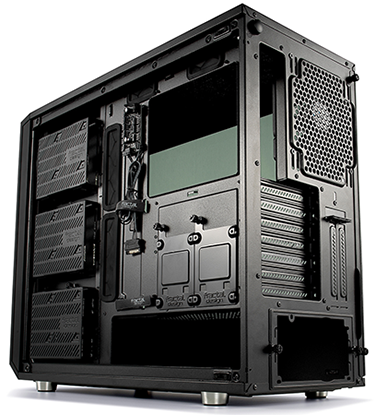 Motherboard support also includes ITX, mATX, ATX and eATX (up to 285mm wide), and storage is handled by a total of five bays. These include the three metal 3.5in trays that are attached to the rear of the storage column as well as two 2.5in trays that can be stowed behind the motherboard or atop the PSU shroud. Choose to fill all three 3.5in bays with hard disks and you'll find a neat three-way SATA adapter included in the package to help minimise cable clutter. All things considered, Meshify S2 is a tidy case to work with. The build process is straightforward, there's plenty of room, cable management is well catered for with Velcro straps, rubber-grommeted routing holes and a large PSU shroud to hide any excess, and in what's becoming something of a rarity, there are no gaudy RGB lights to contend with. 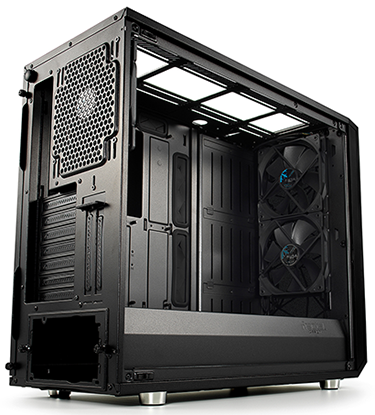 Filtration is also decent - a full-length filter at the base of the case pulls out from the front, while the front and top come away with ease - and we're particularly fond of Fractal's side-panel fixings. Rather than spoil the glass with bolts, the surface is uninterrupted thanks to push-to-lock latching mechanisms that allow each side panel to clip into place easily before securing using the optional thumbscrews. It's a system that works well, and our list of gripes is so short that, well, we can think of only one real niggle; the cable for the front USB Type-C connector is a little short and only just reaches our motherboard header.